As someone who teaches classes on pricing, I was really interested to hear this segment about “price anchoring” on Marketplace Money yesterday (get ready, because I’m about to really geek out here). According to Nick Epley, who teaches behavioral science at the University of Chicago Booth School of Business, the decisions we make involving numbers (such as how many of something to buy, and how much to spend) are based on an “anchor” number. Sometimes we already have the anchor in our head (like the total of your last grocery bill), and sometimes it’s just a random number that appears in front of you. One example Mr. Epley gave is that people will guess that a football player made more tackles in a year if his jersey number is 97 than if it’s 27. He also recounted an interesting study in which a grocery store sign suggested that people buy Snickers bars to put in their freezer. In one instance, the sign said to buy “some” Snickers bars, and in another instance, the sign said to buy 18 Snickers bars. People ended up buying far more Snickers bars when they were given an anchor number of 18, rather than the word “some.” The reason this works, says Epley, is that people tend to only use one anchor number at a time, so whatever anchor you walked into the grocery store (or football stadium) with gets replaced by the new anchor that is put in front of you. I wonder if this concept of “anchoring” is also what accounts for people’s tendency to accept more expensive prices on an item if that price isn’t a round or common price number (say, $57 as opposed to $50 or $49.99). 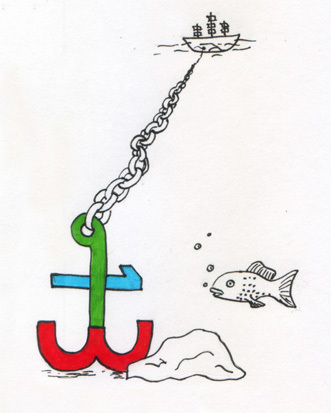 If a price is harder for us to compare to our anchor, are we less likely to fight it? I’d love to see price anchoring tested out a local shop or craft fair. Any takers? p.s. First drawing-a-day with color! Pushing boundaries! Hey Lauren! Am a new reader, and happy to be here! This was soooo informative… I now realise I do that so many times! Me too! That’s why I found this story so fascinating. Thanks! So glad you could join today.